Craniosynostosis is one of a diverse group of deformities in the head and facial bones called craniofacial anomalies. An infant or child with craniosynostosis has improperly fused or joined bones (sutures) in the skull. ("Cranio" means skull; "synostosis" means fused bones.) When children with craniosynostosis also show other body deformities, their condition is called syndromic craniosynostosis. Primary craniosynostosis occurs when one or more of an infant's sutures (where skull bones meet) fuse prematurely. Secondary craniosynostosis results when one or more of an infant's sutures fuse prematurely as a result of lack of proper brain growth. A baby's skull is often thought of as a single piece of bone. However, it is actually made up of several bones that fit together like a jigsaw puzzle. These areas meet at what are called sutures. Sutures allow a growing baby's brain to expand. The four sutures come together at the fontanel, or "soft spot" in a baby's head. Eventually the sutures stop growing, and the cranial bones fuse. Sometimes a suture is fused too early, however, preventing a growing child's brain from expanding. This condition can cause the brain to grow more rapidly in another area of the skull. The result is an abnormally shaped skull. Sometimes this happens before birth (congenital), or sometimes it occurs as the baby develops after birth. Metopic: This suture extends from the top of the head down the middle of the forehead to the nose. Coronal: This suture extends from each ear to the fontanelle. Sagittal: This suture extends from the front of the head to the back, down the middle of the top to the head. Lambdoidal: This suture extends across the back of the head. The form of craniosynostosis depends on the suture or sutures that are affected. Plagiocephaly is the most common form of craniosynostosis. It occurs in approximately one out of every 2,500 births. Plagiocephaly involves early fusion of either the right or left side of the coronal suture, the suture that extends from each ear over the top of the head to the fontanelle. The forehead and brow of a child with plagiocephaly look as if they have been pushed back or flattened because the forehead and brow have stopped their normal growth. Brachycephaly, which means "short headed," occurs when the right and left coronal sutures close prematurely. Brachycephaly results in an abnormally broad head with a high forehead. It is often associated with other craniofacial abnormalities, including Crouzon syndrome, Apert syndrome, Pfeiffer syndrome, and Saethre-Chotzen syndrome. It also is associated with Down syndrome (trisomy 21). This type of craniosynostosis involves fusion of the metopic suture that runs from the top of the head toward the nose, which can create a ridge running down the forehead and gives the front of the head a wedge-shaped effect. The eyes also may be close together. This early fusion involves the sagittal suture that runs from front to back on the top of the skull. The result can be a long, narrow skull. Positional nonsyndromic plagiocephaly is a form of craniosynostosis. In 1992, the American Academy of Pediatrics recommended that infants sleep on their backs to reduce the risk of sudden infant death syndrome (SIDS). This successfully reduced the number of infants with SIDS, but also increased the number of infants suffering from positional plagiocephaly due to back sleeping. An infant with positional nonsyndromic plagiocephaly has a flattened skull at the back of the head. This condition is also commonly called positional molding or deformational plagiocephaly. Craniosynostosis occurs in one out of 2,000 live births in the United States. It affects males twice as often as females. Of those affected, 2–8 percent have primary craniosynostosis and the remaining cases are secondary craniosynostosis. Plagiocephaly is the most common form of craniosynostosis. It occurs in approximately one out of every 2,500 live births. Sagittal craniosynostosis is the most common type of single suture craniosynostosis. It is estimated to occur in one in 4,000 to 8,500 live births. Although sagittal craniosynostosis mostly occurs by chance, about 2–6 percent of cases are considered to be inherited. Frequencies of the types of craniosynostosis based on suture classification include: sagittal (50–58%); coronal (20–29%); metopic (4–10%); and lambdoid (2–4%). As of 2004 the exact cause of craniosynostosis is not understood. Many scientists believe it is the result of a defect in the ossification (bone formation) in the bones of the skull. Craniosynostosis usually occurs by chance (sporadic). In some families, however, it is inherited. Genetic abnormalities such as craniosynostosis are described by the type of chromosome that carries the abnormal gene and whether the gene is recessive or dominant. The autosomal chromosomes are the nonsex chromosomes. In order for a child to inherit an autosomal recessive abnormality, both parents have to be carriers of the abnormal gene. When both parents are carriers, there is a 25 percent chance that each child born will inherit the abnormal gene and develop craniosynostosis. The child also has a 50 percent chance of inheriting the abnormal gene and becoming a carrier. Males and females are affected equally. When one parent has the abnormal gene and the other parent has normal genes, craniosynostosis can still result. That is because the abnormal gene dominates the normal gene. For an autosomal dominant disorder when one parent is a carrier of the abnormal gene, there is a 50 percent chance each child born will inherit the abnormal gene. Males and females are affected equally. Other genetic syndromes, such as Crouzon syndrome, Apert syndrome, and Pfeiffer syndrome, are associated with craniosynostosis. All have different patterns of inheritance and chances of recurrence. Endocrine disorders: Hyperthyroidism (overactivity of the thyroid gland), vitamin D deficiency , renal osteodystrophy (defective bone development), hypercalcemia (high levels of calcium in the blood), and rickets (weakened bones resulting from vitamin D deficiency). Hematologic disorders: Bone marrow diseases including sickle cell disease, and thalassemia. Inadequate growth of brain: Microcephaly (abnormal smallness of head), and hydrocephalus (abnormal buildup of cerebrospinal fluid in the head). Craniosynostosis is a progressive condition that must be treated. The skull and facial asymmetry associated with craniosynostosis are frequently observed by an infant's pediatrician or family physician. Parents may also observe the condition. Craniosynostosis may be present at birth or may be observed later when a child has delays in neurological development. It often may be diagnosed by physical examination alone. Craniosynostosis may be suspected when an infant has an abnormally shaped head or a small bony ridge along the skull in various locations. The condition may also be suspected if a baby's fontanel (soft spot) closes off earlier than expected. The physician will do a complete physical exam and take a complete prenatal and birth history of the child, including position in the uterus. Family history of craniosynostosis or other craniofacial abnormalities also will be discussed. Since craniosynostosis may be associated with other neurological and muscular disorders, such as Crouzon syndrome, Apert syndrome, or Pfeiffer syndrome, the physician will also discuss whether there have been any delays in the child's developmental progression. If craniosynostosis is suspected, an x ray or a CT scan of the child's skull will be taken. In addition, DNA testing can help identify the gene mutations that can cause the condition. Mutations in what are called fibroblast growth factor receptors (FGR1, 2, and 3) and the transcription factor TWIST are responsible for several types of craniosynostosis. Apert syndrome —A craniofacial abnormality characterized by abnormal head shape, small upper jaw, and fusion of fingers and toes. Asymmetrical —Unbalanced, disproportionate, or unequal. Brachycephaly —An abnormal thickening and widening of the skull. Coronal suture —Skull suture that lies behind the forehead area, across the head from left side to the right side. Craniosynostosis —A premature closure of one or more of the joints (fissures) between the bones of the skull, which causes an abnormally shaped skull. Crouzon syndrome —A disorder characterized by malformations of the skull and face. Deformational plagiocephaly (positional molding) —A form of craniosynostosis in which the head is misshapen, the result of constant pressure to the same area of the head. Lambdoidal suture —The suture between the two parietal bones and the occipital bone in the skull. Metopic suture —Suture extending from the top of the head down the middle of the forehead to the nose. Pfeiffer syndrome —This condition includes craniosynostosis, shallow eye sockets, underdevelopment of the midface, short thumbs and big toes, and possible webbing of hands and feet. Plagiocephaly —A form of craniosynostosis that involves fusion of the right or left side of coronal suture. Sagittal suture —The suture between the two parietal bones in the top of the skull. Scaphocephaly —An abnormally long and narrow skull. Suture —A "seam" that joins two surfaces together, such as is found between the bones of the skull. Also refers to stitching together the torn or cut edges of tissue. Trigonocephaly —An abnormal development of the skull characterized by a triangular shaped forehead. For most children with craniosynostosis, facial and skull deformity will be obvious and may be expected to worsen as the child grows. Surgical management by experienced neurosurgeons (brain surgeons) and orthopedic (bone) surgeons will be necessary in most cases. It usually is performed between the ages of six and ten months. 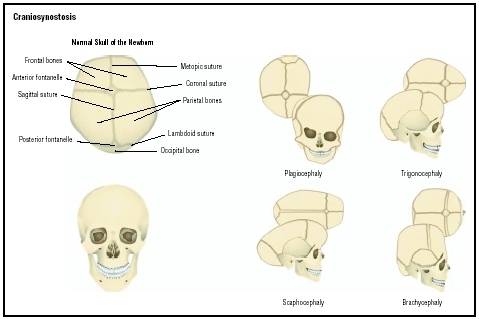 Illustration of a normal skull (left) and those with the four types of of craniosynostosis. Plagiocephaly, in which one side of the coronal suture closes prematurely, is the most common type. Surgery involves releasing the fused sutures and reshaping the bone of the skull and eye orbit. The fused sutures are excised (removed), and the skull reshaped and replaced with a variety of materials. Surgery usually lasts for three to seven hours, and several days of hospitalization are necessary to monitor and treat any complications of the surgery. When more severe deformities are present, repeat surgery of the skull and eye sockets may be necessary. This will help release and advance the child's mid-face. In the early 2000s, newer, less invasive techniques are being developed using endoscopes. Endoscopes are narrow tubes that are inserted into the brain through narrow incisions (cuts). They allow surgeons to visualize the brain and pass tiny surgical instruments through the tube to perform surgery to re-open the sutures and allow the brain to grow normally. Children born with co-existing craniofacial conditions, such as Apert syndrome, which affects the growth of the jaw, may benefit from a technique called mandibular bone lengthening or distraction osteogenesis. This technique was first used in Russia to treat bone problems in the leg and has now been used successfully to correct deformities of the jaw. Positional plagiocephaly, the result of an infant's back sleeping position, can be treated by varying the infant's sleeping position from back to side sleeping, and providing tummy play time. A wedge-shaped foam pillow sold at many baby stores may help position the infant for side sleeping. The child may also be repositioned in the crib or the crib's location changed. When positional molding is identified at less than three months of age, repositioning is usually successful in stopping the plagiocephaly and reversing the flattening. If the flattening is severe or the condition is not caught until an infant is older, a helmet may be necessary. The helmet is specifically made for the infant by an orthotic specialist, a person who creates devices that provide more normal functioning for impaired people. The infant may wear the helmet for up to 23 hours daily, removing it only during baths. Average length of treatment is three to six months. The helmet gently redirects the skull's growth and is most successful when the skull is most pliable, from about three months to about six months. The plagiocephaly will be monitored throughout this time, and the helmet adjusted as the child grows. It is important to detect and treat craniosynostosis early. Untreated craniosynostosis will remain the same or worsen as a child grows and can affect a child's mental and physical development. Associated neuromuscular conditions also may affect the child's development. A child with craniosynostosis will require ongoing medical evaluations to ensure that the brain, skull, and facial bones are developing properly. As of 2004 there was no known prevention for craniosynostosis. Nothing that parents did or did not do causes the condition. The exception is positional plagiocephaly, which results from an infant being put to sleep on the back. This can be prevented by varying the infant's sleeping position from back to side sleeping, and providing tummy play time. A wedge-shaped foam pillow sold at many baby stores may help position the infant for side sleeping. Parents who have an increased likelihood of carrying the genes that result in craniosynostosis may seek genetic counseling to better understand inheritance patterns and chances for reoccurrence. The physical symptoms of an asymmetrical face and head seen when a child has craniosynostosis are readily apparent and may cause the child embarrassment. The pressure a growing brain exerts on a fused suture also can cause a delay in development or, rarely, permanent brain damage. In addition, several conditions exist along with craniosynostosis and need to be evaluated. A child needs to be carefully evaluated when craniosynostosis is present to distinguish between positional plagiocephaly, caused by back sleeping, and other forms of craniosynostosis. Positional plagiocephaly can be treated by repositioning the infant and perhaps by having the infant wear a helmet. Craniosynostosis must be treated by surgery. The differential diagnosis and treatment of posterior plagiocephaly is a challenging aspect of craniofacial surgery. Coumoul, Xavier, and Deng Chu-Xia. "Roles of FGF receptors in mammalian development and congenital diseases." Birth Defects Research Part C: Embryo Today: Reviews 69 (2003): 286–304. Jimenez, David, et al. "Endoscopy-assisted wide-vertex craniectomy, barrel stave osteotomies, and postoperative helmet molding therapy in the management of sagittal suture craniosynostosis." Journal of Neurosurgery (Pediatrics 5) 100 (2002): 407–17. Kabbani, H., and T. S. Raghuveer. "Craniosynostosis." American Family Physician 69 (June 15, 2004): 2863–70. Panchal, Jayesh, and Venus Uttchin. "Management of Craniosynostosis." Plastic & Reconstructive Surgery 111 (May 2003): 2032–49. Crouzon Support Network. PO Box 1272, Edmonds, WA 98020. Web site: http://www.crouzon.org/. "Autosomal dominant." MedlinePlus , June 15, 2003. Available online at http://www.nlm.nih.gov/medlineplus/ency/article/002049.htm (accessed December 9, 2004). "Autosomal recessive." MedlinePlus , June 15, 2003. Available online at http://www.nlm.nih.gov/medlineplus/ency/article/002052.htm (accessed December 9, 2004). "Craniofacial Anomalies." The Children's Hospital of Philadelphia , 2002. Available online at http://www.chop.edu/consumer/your_child/condition_section_index.jsp?id=-9703 (accessed December 9, 2004). "Craniosynostosis: A new less, invasion treatment." Craniosynostosis Net , July 15, 2003. Available online at http://www.craniosynostosis.net/about.html (accessed December 9, 2004). HI,MY son is only of 5 months and he his problem of open head bone and doctors wants to do his surgery .i want to is this surgery is safe for hi?